Dr. Benjamin Franklin (1706-1790) – A leading Founding Father of the United States, Franklin was also an author, printer, political theorist, politician, postmaster, scientist, musician, inventor, civic activist, statesman, and diplomat. He earned the title of “The First American” for his tireless campaigning for colonial unity. Benjamin Franklin was born in Boston, Massachusetts on January 17, 1706, the 15th child in a family of 17 children. His father was a candle maker and soap-boiler. Intending to make a clergyman of Benjamin, he sent him, at the age of eight, to a grammar-school, with the purpose of fitting him for college. The boy made rapid progress, but before the end of his first school year his father took him out due to the expense, and put him into a school where he would learn more practical subjects, such as writing and arithmetic. The last study proved very difficult for him. Two years later, at the age of ten, he began to work in his father’s shop, where he spent his time cutting wicks for the candles, filling the moulds with tallow, selling soap in the shop, and acting the part of errand boy. Many times he had watched the vessels sailing in and out of Boston Harbor, and often in his imagination, had gone with them on their journeys. Now he longed to become a sailor, and, quitting the drudgery of the candle shop, to roam out over the sea in search of more interesting life. But, his father wisely refused to let him go. His fondness for the sea, however, took him frequently to the water, and he learned to swim like a fish and to row and sail boats with great skill. In these sports, as in others, he became a leader among his playmates. With all his dislike for the business of candle-making and soap-boiling, and with all his fondness for play, he was still faithful in doing everything that his father’s business required. His industry, together with his liking for good books and his keen desire for knowledge, went far toward supplying the lack of school training. He spent most of his leisure time reading and devoted his savings to collecting a small library. His father, noting his bookish habits, decided to apprentice Benjamin to his older brother, James, a printer in Boston. Benjamin was to serve until he was 21 and to receive no wages until the last year. In this position he was able to see more books and made good use of his opportunities. Often, he would read far into the night, a borrowed book that had to be returned in the morning. He also wrote some verses and peddled them about the streets, until his father discouraged him by ridiculing his efforts. About this time, in order to get money for books, he told his brother that he would be willing to board himself on half the money the board had been costing. To this, his brother agreed, and Benjamin lived on a very meager diet. Remaining in the printing-office at noon, he ate such a simple lunch as a biscuit or slice of bread and a bunch or two of raisins. As a meal like this required but little time, young Franklin could spend most of the noon hour reading. By living this way he easily saved half of what his brother allowed him, and at once spent his savings in books. His youth was never idle, because he put a high value upon time; he was never wasteful of money, because he knew the easiest way to make money was to save what he had. These were qualities which helped Benjamin Franklin to get on in the world. But, during this period of his life he had great hardships to bear, for his brother was a stern taskmaster, and was so hot-tempered that he would sometimes beat Benjamin cruelly. In the end, the two brothers had so many disagreements that Benjamin determined to run away and seek his fortune elsewhere. Having sold some of his books to get a little money, at the age of seventeen, he secured a passage on board a sloop for New York. Upon his arrival, friendless and almost penniless, he began to visit the printing offices in search of work. But failing to find any, and being told that he would be more likely to succeed in Philadelphia, he soon headed to Pennsylvania. At that time, the journey, just a distance of ninety miles was difficult. He first had to go by a sailboat from New York to Amboy, on the New Jersey coast. On the way, a storm came up, which tore the sails and drove the boat to the Long Island shore. All night Franklin lay in the hold, while the waves dashed angrily over the boat. At length, after thirty hours, during which he was without food or water, he was landed at Amboy. As he had no money to spare for coach hire, he started to walk along the rough country roads, the fifty miles across New Jersey to Burlington. For over two days he trudged along in a downpour of rain. At the end of his first day’s journey he was so wet and mud-spattered, and had such an appearance of neglect, that on reaching an inn, there was talk of arresting him for being a runaway servant. Having arrived at Burlington, he was still twenty miles from Philadelphia, and boarded a boat for the remainder of his journey. As there was no wind, the passengers had to take turns at the oars, and in this way, they continued down the Delaware River. The next day, they reached Philadelphia, and young Franklin, poorly clad and travel-soiled, with only a little money in his pocket, was making his way alone through the streets of Philadelphia. But, he was cheerful and full of hope. In a short time he found work with one of the two master-printers in Philadelphia. One day, while at work in the printing office, he received a call from Sir William Keith, Governor of Pennsylvania. Governor Keith’s attention had been directed to this 17 year-old youth by Franklin’s brother-in-law, and he called on this occasion to urge him to start a printing press of his own. 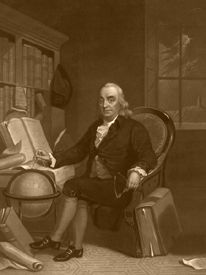 When Franklin said he had not the money to buy a printing-press and type, the Governor offered to write a letter for Franklin to take to his father in Boston, asking him to furnish the loan. The following spring Franklin took the letter to his father, but the father refused to lend him the money. 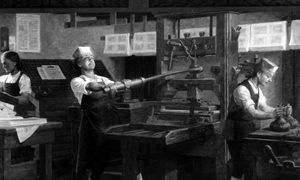 Upon Franklin’s return to Philadelphia Governor Keith advised him to go to England to select the printing-press and other things necessary for the business outfit, promising to provide funds. Franklin took him at his word, and sailed for London, expecting to secure the money upon his arrival there. But, the faithless Governor failed to keep his word, and Franklin was again stranded in a strange city. Without friends and without money, he once more found work in a printing office, where he remained during the two years of his stay in London. After earning enough money, he finally returned to Philadelphia in 1726. Four years later, in 1730, 24 year-old Franklin publicly acknowledged an illegitimate son named William, who would eventually become the last Loyalist governor of New Jersey. That same year, he established a common-law marriage with Deborah Read on September 1, 1730. The couple took in Franklin’s young recently acknowledged illegitimate son, William, and would later have two children of their own.